Memory foam is a revolutionary way to rest. With advanced pressure relief and support, memory foam will help you to wake restored and refreshed for your day. Memory foam offers multiple benefits over traditional mattresses. The major benefit is the cellular structure that memory foam consists of. While typical coils are spaced throughout a bed, memory foam cradles your body at every point so you feel supported and relaxed. We're so confident you'll love it, we offer a money-back guarantee. Better Pressure Relief & Support. With its continuous, full bodied design, memory foam envelops your body and provides unmatched pressure relief and pushes against your body to support it. Faster Relief for Aches & Pains. By conforming to your body at your pressure points, memory foam can alleviate stress and pain you collect during the day. With its advanced cell structure, memory foam subtly absorbs your motion so you can easily get in and out of bed without disturbing your partner. Getting the right pressure relief & support. When choosing a memory foam bed, it is important to consider what mattress will provide the proper pressure relief and support for your weight, sleeping positions, and chronic pains. The position you find most comfortable at night has a large impact on the amount of pressure relief and support your mattress will require. If you don’t know your most common position, take a mental note of how you fall asleep and how you wake up. The position you wake up in is most likely your dominant sleeping position. While every mattress material has particular concerns associated with it, most problems surrounding memory foam have been solved by new innovative production processes and cutting-edge technology. With new advancements in production, memory foam can have a large, open-cell structure that allows for better airflow within the mattress, to let you always sleep cool. If you usually sleep warm, regardless of what you’re sleeping on, you should look for memory foam that has been processed to remove the foam’s cell membranes. This let's memory foam breathe even more efficiently. When memory foam mattresses first came on the market, they were prohibitively expensive. Now, thanks to direct-to-consumer shipping, you won’t have to worry about retail markups and be able to order an affordable memory foam bed straight to your house. Slow response times within the foam cells can make moving around in bed a nightmare. Large, open-cell memory foam responds to the body quickly so that when you move, your bed will easily move with you. With the new production processes Variable Pressure Foaming, memory foam can be produced without any harmful blowing agents and a finished product low in VOCs. VPF is the world’s cleanest way to produce foam. Unfortunately, the majority of companies still produce foam in open chambers. While this is a good overview of how Amerisleep stacks up against traditional memory foam beds, we've also looked at how we compare to some of our biggest competitors. Check out how we compare to TempurPedic® in our in-depth guide. Making sure you love your mattress. Buying a memory foam bed, especially online, can feel risky, but a risk-free trial is extremely important. A trial period should be at least 30 nights so you fully become accustomed to your new bed. The longer the trial period the better. We offer 100 nights to try your mattress. Take that time to test your mattress however you see fit. If you don’t love how you’re sleeping, call us and we’ll arrange for your mattress to be picked up and refund you in full. If you're still unsure before purchasing, read our mattress reviews to see what others have experienced with our beds. Our reviews are verified through a third-party service so you know they're real. After testing dozens of mattresses, leading review site Mattress Clarity rated Amerisleep the #1 Overall Mattress for 2017. Health benefits of a memory foam mattress. Because of the way memory foam compresses into itself to provide consistent support, many people (including verified reviews from Amerisleep customers) say it helps relieve pain and pressure points. Is memory foam safe for children? For infants and toddlers, memory foam is not a great idea. However for older children and teens, memory foam is a safe and smart investment in improving your children’s sleep. Look for memory foam free of harmful chemicals like formaldehyde or CFCs to ensure that your child isn’t breathing in toxic chemicals. Supporting a memory foam mattress. When you’re ready to purchase a mattress, pay attention to what is supporting your bed. Having improper support can make memory foam sag or, in rare cases, cause damage to your mattress. You can use an existing box spring if it's still in a good working condition. It may require placing a 3/4” piece of plywood on top to ensure the stability and support. If the foundation is sagging, it may be time to replace. A flat, solid platform will support your Amerisleep mattress perfectly. When using a slatted foundation, we require that your slats are no more than 3" apart and at least 0.5" tall. Find the right memory foam mattress. Back: This position for sleeping is quite common. To keep the spine in alignment make sure your hips don't sink too much into the bed. Stomach: Sleeping on your stomach needs a firmer mattress so that your hips don't sink and your neck and spine are straight and in alignment. Side: This is the most common sleeping position. You should look for something that will contour to your body and keep your hips and shoulders in alignment. Combo: For those that move about at night or don't have a set sleeping style, you should choose a firmness depending on preference. Our mattress covers are infused with Celliant®, an advanced fabric that helps maximize the performance our mattresses. As you give off body heat, Celliant® safely recycles this thermal energy into infrared light using high-performance yarn made from 13 thermoreactive minerals. Our Greenguard Fire Sock wraps each mattress and acts as a flame retardant. The rayon fiber material is made from natural cellulose and doesn't contain any harmful chemicals. It will keep you safe and healthy at night. Affinity layers work to transition between the other layers in the mattress to enhance their responsiveness and supportiveness. This layer will soften the feel of the bed while keeping you supported. Bio-Core is the base support of our mattresses. 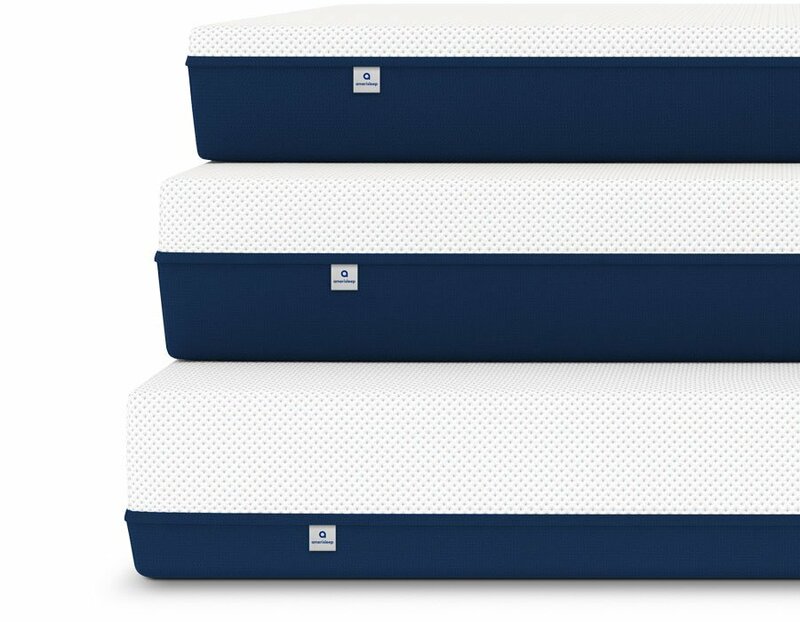 It provides consistent and durable support for the other memory foam layers, and helps ensure our mattresses don't lose their firmness or sag over time. 1Prices reflect current promotion or sale. Common questions regarding memory foam mattresses. What should I expect to pay for a memory foam bed? With new advancements in technology, memory foam spans all budgets. Price does not always equate to a better product. The sweet spot is a technologically advanced mattress that doesn't cost a fortune. Is memory foam going to affect my allergies? If you suffer from chronic allergies a memory foam bed is great to sleep on. Because of its resistance to dust mites and common allergens, memory foam will stay clean and won't affect your allergies. Density refers to how heavy a cubic foot of foam is. The higher the density, the more costly it is to produce. Extremely high dense foam, around 8lbs, can be hard to move around in, and give a quicksand feeling. Too low of a density, less than 3lbs, will breakdown with normal use at an accelerated rate. Is higher density foam a higher quality product? Density is usually a good way to determine the quality of memory foam. A medium density foam, about 4lbs, will accommodate most people's needs of durability. With advancements in foam production, lower density can outperform foam of a higher density. When produced using a closed chamber, variables can be tightly controlled and produce a more consistent product making it more durable. Since the support core does not interact with your body, the density should not be lower than 1.5 density. This way your body is supported properly while still able to hold up normal wear and tear. Do you need to rotate or flip memory foam? With innerspring mattresses, coils would wear down and be extremely prone to sagging where you lay at night. High quality memory foam mattresses don't require flipping or rotating because they aren't prone to sagging. How do I clean a memory foam bed? While the memory foam itself shouldn't be cleaned, the cover surrounding your mattress may need light washing. Cleaning this cover is as simple as spot washing affected areas with warm water and soap. Certain covers, like ours, should not be washed in your home washing machine. We recommend getting your mattress cover dry cleaned if heavy soiling occurs. Many memory foam beds also feature 4-sided zipper covers that can be removed for washing without having to lift the bed. Sleep better in your bedroom for 100 nights, risk-free.